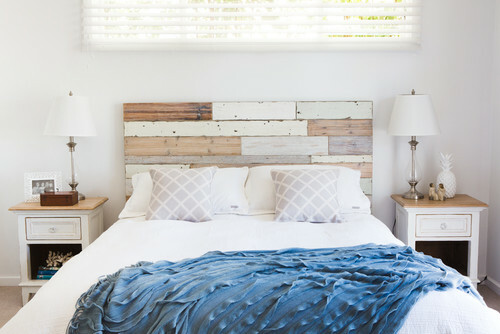 Check out 16 DIY Headboards we think you will fall in love with. Headboards can run in the hundreds or thousands of dollars. There is no need to spend hard earned dollars as you will see below. Add your personal touch with custom shapes, designs, colors and materials and create a bedroom look you’ll love. Easier said than done you say? Not really. Check this out! Could you imagine something like this in your bedroom? This super cute DIY Vintage Design is easy to recreate. 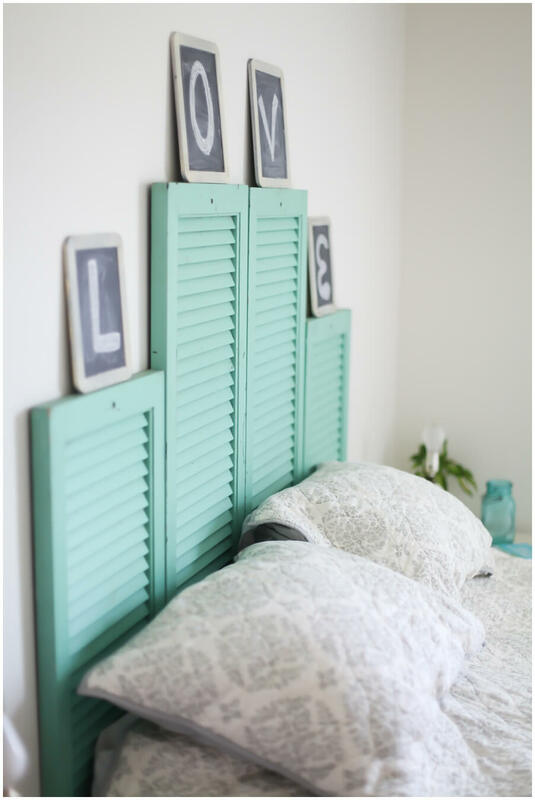 Made from refurbished shutters which you may score at the local trade days or resale stores. I often see them on the side of the road on bulk trash day, when people throw out old and unwanted items. Creative Headboards like this made from weathered palettes in a variety of tones give this bedroom a rustic appeal. Simple and unique. Don’t have time or patience to make, check out these Weathered Shabby Chic Headboard. 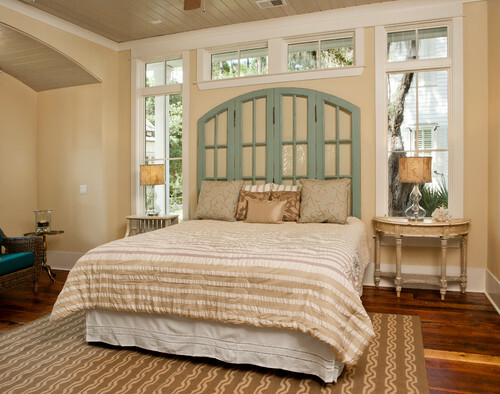 One of the many cool headboard ideas made from big window panels. Simply put the panels behind your bed and secure to the wall. One of the most awesome headboard ideas is this one. Create this romantic bedroom style with Curtains in place of Headboard. Chalkboard Headboards are fantastic. Frequently change by drawing or writing new Images and Quotes. Create custom messages for loved ones. This cheap diy headboard can be created on any wall, in any size. Here is an example of an diy headboard idea for beds in smaller spaces. Decals look amazing as backdrop instead of headboards and take up no space. Decals are inexpensive and won’t damage walls. They can be easily taken down or exchanged for a different design. This is a fun project and looks fantastic. Simple and beautiful. Assorted colored mirrors randomly distributed over Sheer Curtains. Place your favorite Artwork or Photographs on a Shelf behind your bed. Sleek and stylish. Create a collage of your favorite pictures of paintings on the wall over your bed instead of the traditional headboard. Exchange pictures according to seasons, color scheme or style. One of my favorite wooden headboard ideas is this gorgeous whitewash Wooden Headboard. The matching bed frame gives this design a charming look. One of the most unique headboard ideas i’ve seen is this mantel. I never thought of using a Mantel as a headboard but here it is and it looks fantastic. Adden bonus – space for special knick knacks or decor. Wonder how to make a headboard like this one? Measure your space and get all supplies at your local hardware store. Paint with your favorite color and mount to wall. Custom lighting can be added but is not necessary. Here is a homemade headboard idea. This beautiful bed Canopy by designsponge is constructed with just a length of fabric and two curtain rods. Give your bedroom a royal feel with this design. A beautiful ornate curtain rod and silk fabric create a luxurious backdrop. Gives any bedroom a cozy and romantic feel. Old Mirror Frames are a great alternative to headboards and fill in wallspace behind the bed. They are hard to find as more people are aware of these treasures that used to be disregarded. If you are lucky and find one, here is your next project. Use a large piece of fabric, draw or write your favorite quotes or messages and hang with curtain rod. A lovely shower curtain will do as well. This is is a fun idea for a day bed setting. Now that you’ve seen a number of alternative headboard ideas, you know that there is more than one way to create the perfect bedroom oasis. Furniture for bedrooms can run in the thousands, but armed with this new knowledge you will be able to create your own headboard for much less. Happy headboarding!